Moonen has launched the 42 metre custom motoryacht named Sofia for a repeat client. As well as being the largest superyacht launched to date by the Moonen yard, Sofia will also make waves with her unique three-seater submarine. After sea trials and final delivery in November, the displacement yacht will head across the Atlantic for an extended cruise in the Caribbean. The owner of this brand-new Moonen travelled to the yard in person for the launch and expressed his delight at how the specific requirements for this fully custom motoryacht had been brought to fruition. This is the third major motoryacht that he has built at Moonen and during a short acceptance speech the owner confessed he was already considering possibly ordering an even larger project sometime in the future. With plans afoot to increase the building capacity at Moonen, Sofia may not hold the size record for very long. Any leading shipyard that offers owners a genuinely tailor-made superyacht must always be open to new ideas, and Sofia serves as a testimony to the flexibility available at Moonen. Not long after construction began the owner decided to extend the yacht by a further four feet in order that she could carry a submarine capable of seating three passengers instead of the originally specified two. 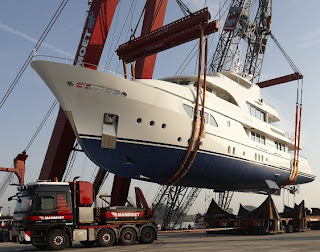 This involved the creation of a unique launching system which, like the rest of the superyacht, has fully met all the requirements for Lloyd's and MCA classification. No other luxury motoryacht in this size range has a submarine that can take three people to depths of one hundred metres. Another key aspect of a high-end project such as Sofia is the way in which the yard cooperates with the other leading players involved in the superyacht build. Stolk Marimecs was responsible for the naval architecture of an elegant design by Rene van der Velden and the Moonen design team which synthesises rugged adventurous looks with modern superyacht style elements. The interior has an exceptionally bright and open feeling, with large windows bathing the living spaces with light. Art-Line Interiors has created a very special overall style featuring oak wood, Zabrano and Concetto marble. Sofia's atrium, executed with a custom piece of Concetto art made and supplied by Ceaser Stone in Israel, is truly spectacular. There are many high-tech highlights on this sophisticated motoryacht including an integrated foil bridge, a full Kaleidoscope video server with multi-room control via i-Pad, a galley equipped with professional stainless steel equipment, a thermal camera in the top mast, and an MOB system with personal tracking.